The history of lipstick starts in prehistory and continues into the present. From ancient Greece and India to Elizabeth England, people have darkened, painted and adorned their lips with dyes, pigments, plant roots, pencils and rouges. Flushed lips indicate sexual arousal, which is why lipstick, and other lip colorings, remain popular to this day. The history of modern lipstick starts in the 19th century. Before then, men and women would discreetly put on cosmetics at home, though they were seen as signs of effeminacy in men and debauchery in women. Only actors and actresses could get away with wearing makeup––and only on stage. 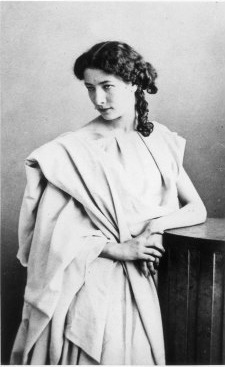 It wasn't until the 1880s that certain actresses, like Sarah Bernhardt, started wearing makeup in public. At this time, lipstick was not yet in a tube. Carmine dye, an extract of ground-up insects, was applied to the lips using a brush. Despite its unappetizing origins, carmine dye was expensive, and not practical for the average woman. The look was also highly theatrical and unnatural, especially by 19th-century standards. This made early lipstick all the more shocking. In the early 1900s, a synthetic form of carmine was infused into an oil and wax base, creating a colored lip ointment that looked more natural than carmine dye. This ointment was more natural looking, and thus became more respectable. However, lipstick was not yet a lip stick. At the turn of the last century, lip color was sold in tinted papers or paper tubes, which made it impossible to carry around in a pocket or a handbag. This meant that women could apply makeup at home, but could do no touch-ups. Around 1915, lipstick started to be sold in metal containers, with various push-up tubes. The first swivel-up tube was patented in 1923, in Nashville, Tennessee. This packaging allowed manufacturers to package to sell, creating stylish and seductive packages for consumer goods. Throughout the 1920s and 30s, hundreds of lipstick tubes were patented in the United States, all with the same basic function: the container would swivel, twist or push a tube of lipstick from a hollow cylinder. Photography also made lipstick more acceptable. Since people (especially women) naturally want to look good for photographs, they started to wear makeup in the photo booth, then outside of it. The Great Depression actually increased demand for lipstick. 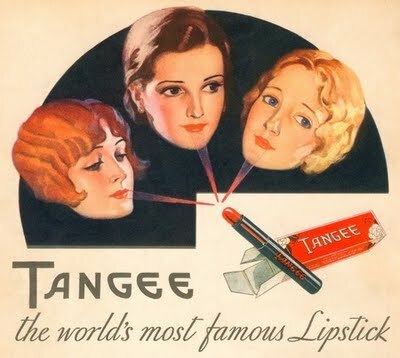 When most people could not afford most luxuries, an inexpensive tube of Tattoo or Tangee was a good, inexpensive tube of lipstick was a good way to satisfy the desire for luxury. This rule still applies today; economists call it the leading lipstick indicator. It was in the 1930s that Max Factor released the first lip gloss. Originally used by movie actresses, Factor's X-Rated lip gloss was such a success that it was sold, continuously, until 2003, when the company retired the item. During World War II, metal lipstick cases were replaced with plastic, then with paper. However, lipstick was still manufactured, both in American and in Europe; it was believed that makeup was psychologically important to women. In America, brand rivalry ceased, and companies concentrated on making cheap lipsticks for women workers. The war also allowed women into previously male-dominated professions, such as engineering and scientific research. One of these women, Hazel Bishop, was an organic chemist in New Jersey and Brooklyn. In the late 1940s, Ms. Bishop tested over three hundred experiments with different lipstick prototypes in her kitchen, perfecting a new formula for a long lasting lipstick. When Bishop's lipstick went public, it quickly became popular, so quickly that Bishop, and her business partner, Alfred Berg, almost went broke. It was through the help of Raymond Specter, an advertising genius, that the company prospered. 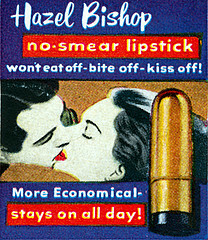 Hazel Bishop brand lipstick was the sponsor of television shows like This Is Your Life. Thus the Lipstick Wars began. In the 1950s, Revlon and Hazel Bishop were the two biggest games in town. While Hazel Bishop brand lipstick was seen as a practical, no-nonsense American brand, Revlon lipstick appealed to a more romanticized side of female psychology. Both companies ran expensive ad campaigns, and may have tapped each other's phones to get more information. Revlon ultimately won. The history of lipstick, especially in the modern era, is driven by competing brands and personalities, all looking for the right look, or formula, to advance their share and influence in the market. For much of the 1950s and 60s, movies drove the crazes in lipstick usage. Many women imitated Elizabeth Taylor's Cleopatra look, as well as Marilyn Monroe's signature red lipstick with platinum blonde hair. In 1973, the Bonne Bell company created the "lip smacker," a colorless lip gloss with a strong, usually fruity, flavor. The gloss was a big hit with teenage girls; the company later made lip gloss in flavors like "rock candy" and "Dr. Pepper," solidifying their commitment to the under-30 set. Further advances in technology led to further, and more hyperbolic, claims. No lipstick, gloss, stain or other topping (besides a tattoo) is completely "kiss-proof," but the history of lipstick advertising shows ever escalating adjectives and promises, even up to the present moment. The history of lipstick is still being written; we invite you to stay tuned for the next chapter. Riordan, Teresa. Inventing Beauty: A History of the Innovations that Have Made Us Beautiful . Broadway Books, 2004. Samantha. 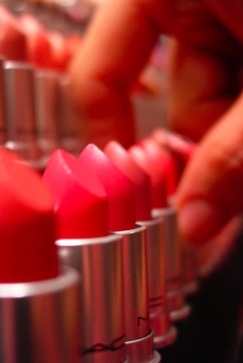 The History of Lipstick - Slightly Gross Origins. Inventorspot.com, 13 May 2008. Accessed 21 February 2010.